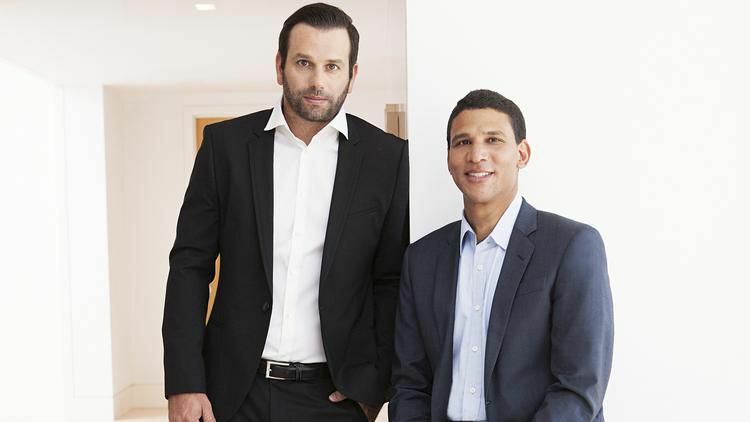 Compass co­founders Ori Allon, left, and Robert Reffkin. Compass, a real estate brokerage and technology platform valued at $1 billion by venture capitalists, is expanding to San Francisco with multiple high­profile hires. The New York­based firm is opening two offices in Pacific Heights and on California Street. The firm said it has hired Malin Giddings, the top nationwide broker at Coldwell Banker, along with Butch Haze and Rick Teed, the top nationwide team from Sotheby’s International Realty. Top­producing San Francisco agents Monica Pauli and Amanda Jones are also joining the firm. Neal Ward, previously with McGuire Real Estate, and Missy Wyant Smit from Hill & Co are also joining. The agents accounted for $1 billion in sales in 2015, according to Compass. "San Francisco and the Bay Area is the technology capital of the world," said Robert Reffkin, CEO of Compass. "It's increasingly a global city." Unlike other nationwide real estate firms, which mostly use a franchising model, Compass will own all of its offices with venture capital funding its expansion, similar to the tech firms that have recently defined San Francisco's economy. Compass was recently valued at $1 billion after raising $75 million from investors Wellington Management, IVP, Joshua Kusher's Thrive Capital and Founders Fund, co­founded by Peter Thiel, the billionaire who also started Paypal. Compass has raised $210 million to date. Compass' expansion follows large residential companies buying local firms, lured by the highest­priced property market in the nation. Yesterday, NRT LLC announced it was buying boutique San Francisco firm Climb Real Estate. Pacific Union International also bought the Mark Co. last year. Reffkin said the firm's competitive edge includes its technology features, which include a mobile app, valuation tools and real­time pricing information. Reffkin says the firm will create a San Francisco database with property data from public and proprietary sources, and also plans to create a Bay Area­focused research team. "We're combining innovative technology with the most experienced agents," said Reffkin, who previously worked at Goldman Sachs Group Inc. (NYSE: GS). Reffkin co­founded Compass with Ori Allon, who sold two tech companies to Google Inc. and Twitter Inc.
Reffkin plans to have 200 agents and employees in the Bay Area within the next two years. The firm is currently looking to open an office in Marin County over the next year, and has future plans to expand to Silicon Valley, said Reffkin. Compass has offices in eight other markets: New York, Washington, D.C., Miami, Boston, the Hamptons in New York, Los Angeles, Santa Barbara and Aspen, Colorado. The firm plans to sell both single­family homes and new multifamily developments. Reffkin said he was confident in the Bay Area's strength as a housing market despite some softening in recent sales prices. "In the very high­end you may see an extended slowdown," said Reffkin. "But outside of the very, very high­end I see a continued resurgence."